Washington Unified School District (WUSD) not only needed a reliable power protection solution, they wanted visibility into their virtualized network. When a fully-virtualized, VMware®-based facility houses all of a school district’s critical services, including multiple active directories, web services, student information systems and the phone system, keeping the center up and running is essential. In their search for top-of-the-class uninterruptible power systems (UPSs) for their demanding data center environment, WUSD wanted a system that would keep everything backed up with enough runtime for a graceful shutdown, but was also easily scalable. 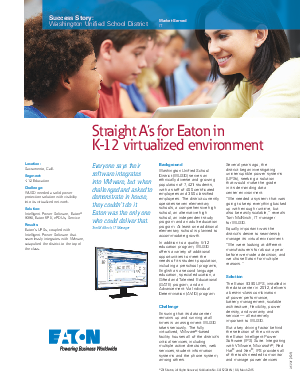 Equally important, the district wanted seamless integration with their virtual environment. Find out how the Eaton 9390 UPS and the Eaton Intelligent Power Software (IPS) Suite made the grade.